With the custom pocket-hole Plug Cutter, you can use pocket-hole joinery virtually anywhere — even in places that show prominently on your project — by hiding the pocket holes with perfectly matched plugs that you create from your from any wood you desire. Plus, the custom pocket-hole Plug Cutter allows you to create face grain plugs that that blend in Amazingly well, whether the plugs are in line with the grain, or they run across the grain. These face grain plugs are easier to hide than conventional plugs that have visible end-grain. In addition, the custom pocket-hole Plug Cutter also accepts accessory bits (sold separately) that can cut plugs that fit Kreg Micro-Pocket™ pocket holes, as well as plugs to work with the Kreg Jig® HD — a Plug size that’s only possible using the custom pocket-hole Plug Cutter. 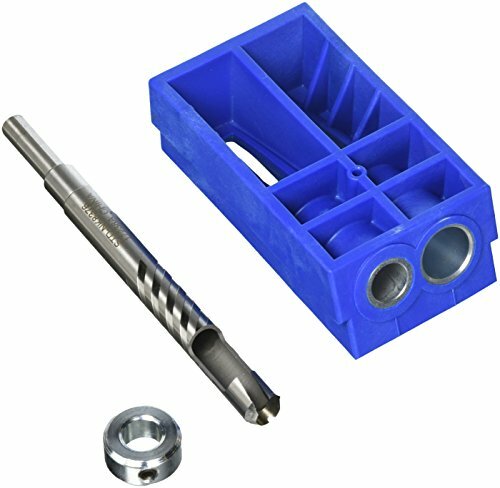 The Plug Cutter simply slips into a Kreg Jig® in place of the normal drill guide Block, and works with a Kreg® Jig K5, K4, or the older K3 model. That allows you to clamp your Plug material in place and drill in the same way that is used for creating pocket holes. To create the plugs, just chuck the Plug cutting bit into any drill. This high-performance bit features a specially designed cutting tip that shears cleanly for a smooth, consistent Plug. Fluting reduces heat and friction for better plugs and longer bit life, while a positive stop collar ensures perfect depth every time to produce accurately sized plugs. Once the plugs are drilled, they can easily be cut free using a band saw or hand saw.